What do you do on your day off? 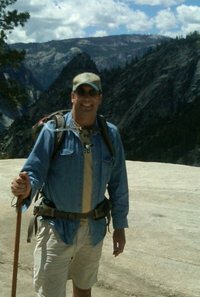 I head to Yosemite and hike. Today I put in 12 miles. 12 heart-pounding, lung-busting, thigh-thumping, toe-crunching glorious miles in the mountains. Today's trek took me about four miles further than I'm used to. And I'm paying for it right now - I can barely move, my legs are so sore and stiff. But it was worth it, definitely worth it. And I'll be back up there as soon as I can find a free day. I often wonder why I enjoy hiking so much. When you think about it, hiking is simply walking - something most of us have done since we were two. Maybe that's why I enjoy it so much. Hiking is simply putting one foot in front of the other over and over again. Not too complicated. Even I can handle that. But I think what motivates me to hike is the challenge to finish. It's that competitive urge that lies deep within me that enjoys the challenge of finishing what I start. I find a sense of achievement in finishing a hike. It feels good to walk farther than I've walked before, on a difficult trail, at high elevations. It feels good to finish. It's not unusual for me to want to quit in the middle of a hike. I'm tired, my legs and feet hurt, I'm dusty and dirty, and I still have another hour of hiking before I can quit. I can't stop, I'm still on the trail on the side of the mountain. But my mind says, "Stop." That's when instinct kicks in and I start placing one foot in front of the other, over and over until I finish. It occurred to me today that life and hiking are a lot alike. Sometimes you just want to quit. You're tired, hurting, and feel like you can't continue. But you keep on going. A wise man once said, "But one thing I do: Forgetting what is behind and straining toward what is ahead, I press on toward the goal to win the prize for which God has called me heavenward in Christ Jesus. " (Philippians 3:13) Finish! This last sentence caught me in complete awe! This is the verse on my brother-in-law's grave stone. It is another reminder of keeping our focus on what lies ahead that God has placed for us......amazing!